If you're anything like me, the name 'Dustbowl' will conjure images of emerging up a set of stairs, across a gauntlet of Heavies, Snipers and Spies, and towards the capture point of a sentry-filled building. But as well as a TF2 map, it's also the name of a post-apocalyptic adventure that's just been released on Steam. It's an intriguing looking thing, boasting a massive world and turn-based combat. 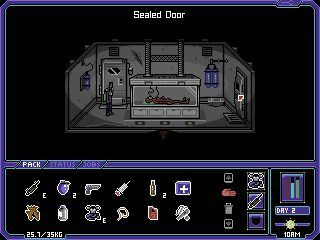 There's survival and crafting too, which suggests that, despite the point-'n-click nature, it's more freeform in its structure. A full thirst, hunger, tired system to keep adventurers on their toes. Unique turn-based combat system with hit locations. More quests and tasks to shake a mutant leg at! Random encounters and easter eggs. A sprawling 15km map of places to explore! Beautiful pixel art environments in a C64 palette. For more, head on over to the Dustbowl site.